Bartholomew I (Greek: Πατριάρχης Βαρθολομαῖος Α', Patriarchis Bartholomaios A' , Turkish: Patrik I. Bartholomeos; born 29 February 1940) is the 270th and current Archbishop of Constantinople and Ecumenical Patriarch, since 2 November 1991. In the Eastern Orthodox Church, he is regarded as the primus inter pares (first among equals), and as the spiritual leader of Orthodox Christians worldwide. Born Dimitrios Arhondonis (Greek: Δημήτριος Αρχοντώνης, Dimítrios Archontónis), in the village of Agios Theodoros (Zeytinli Köyü) on the island of Imbros (later renamed Gökçeada by Turkey), after his graduation he held a position at the Patriarchal Theological Seminary of Halki, where he was ordained a priest. Later, he served as Metropolitan of Philadelphia and Chalcedon and he became a member of the Holy Synod as well as other committees, prior to his enthronement as Ecumenical Patriarch. Bartholomew's tenure has been characterized by intra-Orthodox cooperation, inter-Christian and inter-religious dialogue, as well as by formal visits to Roman Catholic, Old Catholic, Orthodox and Muslim leaders seldom previously visited by an Ecumenical Patriarch. He has exchanged numerous invitations of Church and State dignitaries. His efforts to promote religious freedom and human rights, his initiatives to advance religious tolerance among the world’s religions, as well as his efforts to promote ecology and the protection of the environment, have been widely noted, and these endeavors have earned him the title "The Green Patriarch". Among his many international positions, he currently sits on the Board of World Religious Leaders for the Elijah Interfaith Institute. Bartholomew I was born in the village of Zeytinli (Greek: Άγιος Θεόδωρος, Agios Theodoros) in the island of Gökçeada (Greek: Ίμβρος, Imvros), son of Christos and Merope Archontónis. His secular birth name is Dimitrios Arhondonis (Δημήτριος Αρχοντώνης, Dimítrios Archontónis). He is a Turkish citizen, but he belongs (ethnically) to the historically indigenous Greek community in Turkey, which today is diminished and reduced due to the 1923 population exchange between Greece and Turkey. He speaks Greek, Turkish, Italian, German, French and English; he is also fluent in classical Greek and Latin. Bartholomew I was the target of an assassination plot which was planned to take place on May 29, 2013. One suspect was arrested and there is an ongoing search for two others. Bartholomew celebrating the Divine Liturgy. As Ecumenical Patriarch, he has been particularly active internationally. One of his first focuses has been on rebuilding the once-persecuted Eastern Orthodox Churches of the former Eastern Bloc following the fall of Communism there in 1990. As part of this effort he has worked to strengthen ties amongst the various national Churches and Patriarchates of the Eastern Orthodox Communion. He has also continued the reconciliation dialogue with the Roman Catholic Church started by his predecessors, and initiated dialogue with other faiths, including other Christian sects, Muslims, and Jews. He has also gained a reputation as a prominent environmentalist, putting the support of the Patriarchate behind various international environmental causes. This has earned him the nicknames of "the Green Patriarch" and "the Green Pope", and in 2002 he was honored with the Sophie Prize. He has also been honoured with the Congressional Gold Medal, the highest award which may be bestowed by the Legislative Branch of the United States government. Bartholomew I, after his attempts to celebrate the liturgy in remote areas of the country, thereby renewing the Orthodox presence, which was absent since before 1924, has now come under intense pressure from Turkish nationalist elements. The patriarchal Seminary of Halki in the Princes' Islands remains closed since 1971 on government orders. During his trip to Turkey in November 2006, Pope Benedict XVI traveled to Istanbul on the invitation of the Ecumenical Patriarch of Constantinople Bartholomew I. The Pope participated in the feast day services of St. Andrew the First Apostle, the patron saint of the Church of Constantinople. This was the third official visit to the Ecumenical Patriarchate by a Pope (the first being by Paul VI in 1967, and the second by John Paul II in 1979). In an interview published on 19 November 2006 in the daily newspaper Sabah, Bartholomew I addressed the issues of religious freedom and the then upcoming papal trip to Turkey. He also referred to the closing of the Halki seminary by saying: "As Turkish citizens, we pay taxes. We serve in the military. We vote. As citizens we do everything. We want the same rights. But it does not happen... If Muslims want to study theology, there are 24 theology faculties. Where are we going to study?" He also addressed the issue of his Ecumenical title and it not being accepted by the Turkish government: "We've had this title since the 6th century... The word ecumenical has no political content. [...] This title is the only thing that I insist on. I will never renounce this title." He attended the Papal inauguration of Pope Francis on 19 March 2013, paving the way for better Catholic–Orthodox relations. It was the first time that the spiritual head of Eastern Orthodox Christians had attended a papal inauguration since the Great Schism in 1054. After, he invited Pope Francis to travel with him to the Holy Land in 2014 to mark the fiftieth anniversary of the embrace between Patriarch Athenagoras and Pope Paul VI. Pope Francis was also invited to the Patriarchate for the feast day of Saint Andrew (30 November). On 16 April 2016 he visited, together with Pope Francis and Archbishop Hieronymus, the Mòria camp in the island of Lesbos, to call the attention of the world to the refugee issue. Patriarch Bartholomew, due to his honorific title as the Ecumenical Patriarch of Constantinople, is "first among equals" in honor among all the Eastern Orthodox bishops, presides in person – or through a delegate – over councils of Orthodox primates and/or bishops in which he takes part and serves as a spokesman for the Orthodox communion, especially in ecumenical contacts with other Christian denominations. 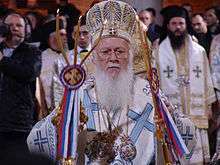 He has no direct jurisdiction nor authority over the other Patriarchs or the other autocephalous Orthodox Churches. His role often sees the Ecumenical Patriarch referred to as the spiritual leader, though this is not an official title of the patriarch nor is it usually used in scholarly sources on the patriarchate. The Orthodox Church is entirely decentralized, having no central authority, earthly head or a single Bishop in a leadership role, having synodical system canonically, is significantly distinguished from the hierarchically organized Catholic Church whose doctrine is the papal supremacy. His titles primus inter pares "first among equals" and ecumenical patriarch are of honor rather than authority and in fact the Ecumenical Patriarch has no real authority over Churches other than the Constantinopolitan. His Holiness Bartholomew is the direct administrative superior of dioceses and archdioceses of Patriarchate of Constantinople and serves millions of Greek, Ukrainian, Rusyn and Albanian believers in North and South America, Western Europe, Australia and New Zealand, and parts of modern Greece which, for historical reasons, do not fall under the jurisdiction of the Church of Greece. 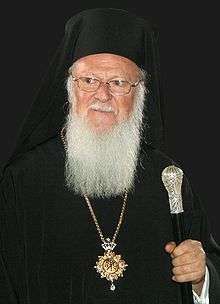 Some of Patriarch Bartholomew's actions have been criticized by other Eastern Orthodox ecclesiastical bodies. In response to his promotion of closer relations with the Catholic Church, the Russian Orthodox Church released a public statement emphasizing that Bartholomew represents only his own Patriarchate, and not the whole of Eastern Orthodoxy, in his meetings with the Catholic Pope. The Orthodox Church in America, while acknowledging the Ecumenical Patriarch's role in "guiding and preserving the worldwide unity of the family of self-governing Orthodox Churches", also emphasizes that "he carries no sacramental or juridical power over bishops outside of his own Patriarchate", and further states that "it is possible that in the future this function may pass to some other church." In 1997, Bartholomew received the Congressional Gold Medal. The Congressional Gold Medal and the Presidential Medal of Freedom are the highest civilian awards given by the United States. In 2002, he received the Sophie Prize for his work on the environment. In April 2008, he was included on the Time 100 most influential people in the world list. In 1999 he was awarded the Grand Cross of the Order of the Star of Romania; in 2004, by Federal President Thomas Klestil, the Great Golden Medal with Ribbon for Services to the Republic of Austria and on 13 March 2007, the third anniversary of the death of Cardinal Franz König, Bartholomew was awarded in Vienna's St. Stephen the "Cardinal König Prize" Foundation "Communio et Progressio". He has been awarded honorary doctorates by a number of universities and educational institutions around the world, among them: National and Kapodistrian University of Athens, Aristotle University of Thessaloniki, TEI of Kavala, Democritus University of Thrace, University of Crete, University of Ioannina, University of the Aegean, University of Western Macedonia and University of Thessaly in Greece, Moscow State University in Russia, University of Iaşi in Romania, City University of London, Exeter University and University of Edinburgh in the United Kingdom, Katholieke Universiteit Leuven in Belgium, St. Sergius Orthodox Theological Institute and Université de Provence Aix-Marseille I in France, Izmir University of Economics in Turkey, University of Bucharest in Romania, Flinders University in Australia, Adamson University in the Philippines, St. Andrew’s College and Sherbrooke University in Canada, Holy Cross Greek Orthodox School of Theology, Georgetown University, Tufts University, Southern Methodist University, Yale University, Saint Vladimir’s Orthodox Theological Seminary in the United States. In October 2009, he received an honorary doctorate from Fordham University in the United States. On October 22, 2011, he received the Grand Collar of the Order of the Eagle of Georgia by HRH Prince David Bagrationi of Mukhran in a ceremony at St. George's chapel. On July 27, 2013, he received Order of Liberty (Ukraine). On August 27, 2015, he received the Order of St. King David the Psalmist from HRH Prince Nugzar Bagrationi-Gruzinski of Georgia in a private ceremony in the Patriarchal palace. 1 2 "The Patriarch Bartholomew". 60 Minutes. CBS. 20 December 2009. Retrieved 11 January 2010. 1 2 Kaya, Bayram (10 May 2013). "One arrested as plot to assassinate Patriarch Bartholomew uncovered". Zaman. Retrieved 10 May 2013. ↑ "The Green Patriarch | Ecumenical Patriarchate of Constantinople". Patriarchate.org. 29 August 2013. Retrieved 3 September 2013. ↑ "Eastern Orthodoxy". www.britannica,com. Britannica. Retrieved 26 July 2015. ↑ "Eastern Orthodox Church". BBC. Retrieved 26 July 2015. ↑ "Eastern Ortthodoxy". www.religionfacts.com. Retrieved 26 July 2015. ↑ "Eastern Orthodoxy". about.com. Retrieved 1 August 2015. ↑ "How is the Orthodox Church organized and held as one worldwide Church?". Retrieved 2 August 2015. ↑ "Congressional Gold Medal Ceremony | Ecumenical Patriarchate of Constantinople". Patriarchate.org. Retrieved 3 September 2013. ↑ "Prize Winners » 2002". The Sophie Prize. 12 June 2002. Retrieved 3 September 2013. ↑ "THE PATRIARCH OF CONSTANTINOPLE DECORATED BY THE HEAD OF THE ROYAL HOUSE OF GEORGIA". Royal House of Georgia. Retrieved 2011-10-29. ↑ "Arcibiskup Bartolomej I. navštívil Bratislavu - Fotogaléria". Webnoviny.sk. Retrieved 3 September 2013. Wikimedia Commons has media related to Patriarch Bartholomew I of Constantinople.